Lubinsky, Reig, Mendelsohn and Cadena. Pressing Dies: the deep groove, and not. My thanks to Chris B, Peter deJ, Aaron W and all who sent in helpful pictures to supplement those scraped from Discogs uploaders and Ebay auctions. Thanks also to commenter Boursin, whose encyclopaedic knowledge of music recording history has set me right on many points . All remaining errors, omissions and mis-spellings are my own. Moving Forces: Lubinsky, Reig, Mendelsohn and Cadena. The Savoy record label was founded in Newark, New Jersey by Herman Lubinsky, a US-born son of Russian émigrés. Lubinsky was an early pioneer of community radio in Newark, who in 1942 founded Savoy Records to publish Jazz, Blues and Gospel music, remaining its sole proprietor until his death in 1974. Another character who loomed large in the life of the Savoy label was Fred Mendelsohn, an entrepreneur, manager, A&R person, and salesman in the recording business. Mendelsohn had been operating a small New Jersey-based label, Regent, which in 1948 Lubinsky acquired a part interest. In 1953 he went to work for Lubinsky, initially for the label Regent, and eventually became the President of Savoy. 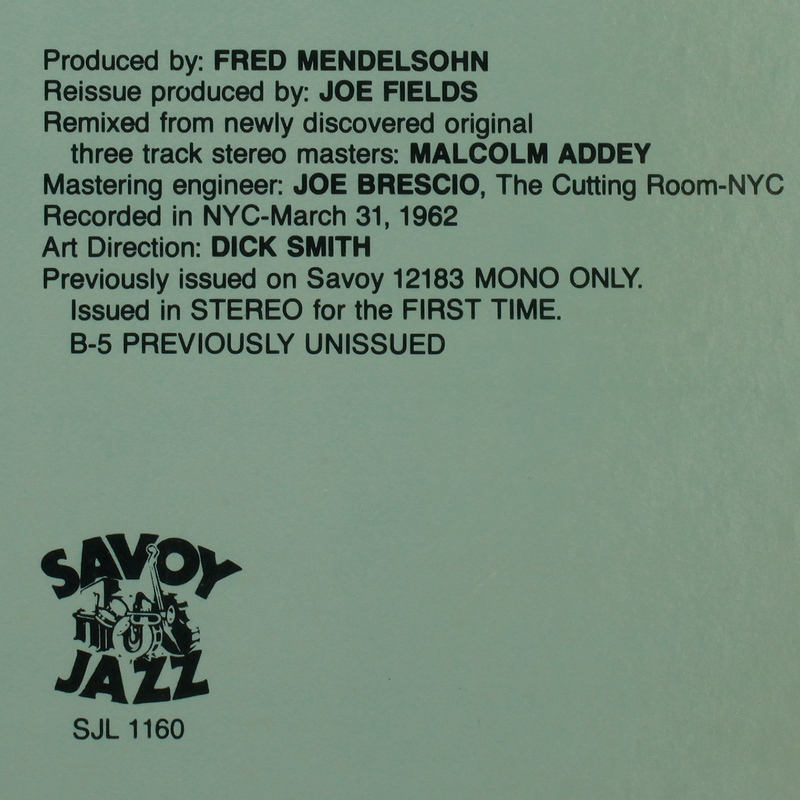 Mendelsohn was largely responsible for Savoy’s prodigious portfolio of gospel recordings, producing sessions in the late ’50s and ’60s. After Lubinsky’s death in 1974, Mendelsohn continued his relationship with Savoy, when Arista Records purchased the company from Lubinsky’s estate. More on label entrepreneur Mendelsohn here. Ozzie Cadena initially worked in the Radio Record Shop in downtown Newark, owned by Herman Lubinsky. Cadena joined Savoy formally in 1954 as an in-house producer and A&R man, working closely with drummer Kenny Clarke to round up various groups of musicians for recording dates in the golden years up to 1959, before eventually heading off to Prestige to replace Esmond Edwards. Lubinsky grew his catalogue buying up defunct record labels and leasing recordings, as well as recording his own sessions. 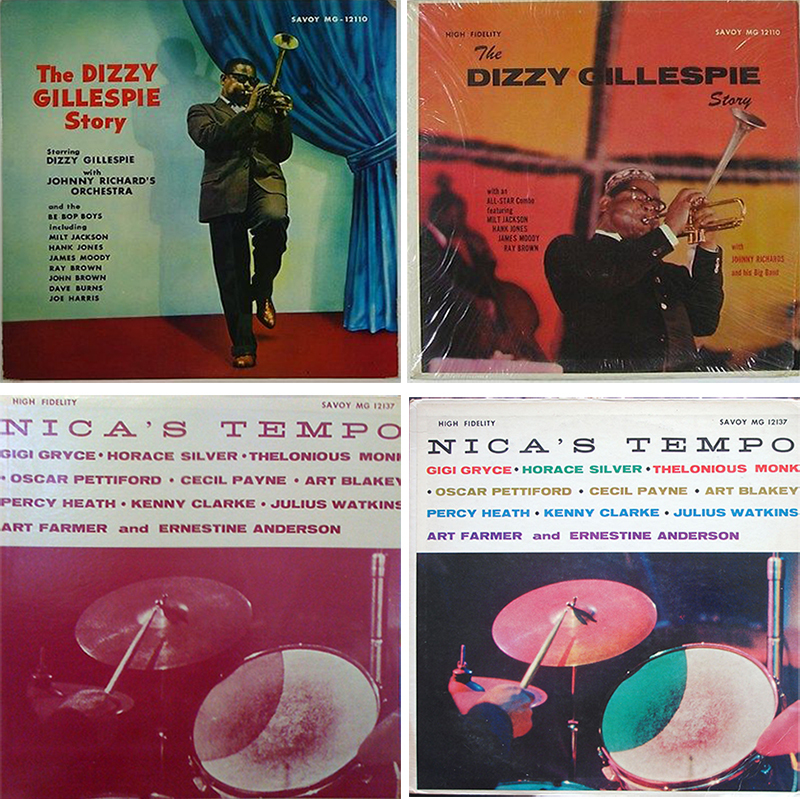 In the golden decade between 1955 and 1966 around 200 new jazz titles were issued on 12″ LP (which was less than half the output of Blue Note), three quarters issued in just the five years up to1960, hence the prevalence of deep groove amongst early original pressings, a time when deep groove pressing dies were the norm. 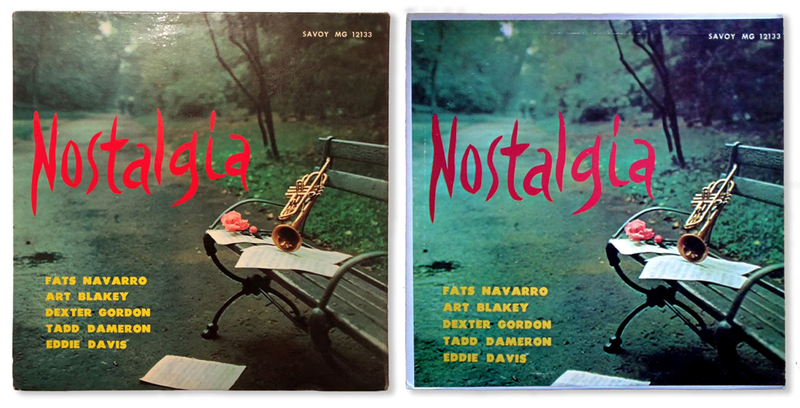 As new Savoy jazz recordings slowed to a trickle, Savoy concentrated instead on its jospel catalogue, and turned to reissuing its earlier jazz catalogue. More reissues appeared in the mid-’70s through Arista Records , and again in the mid ’80s when Joe Fields of Muse bought the catalogue from Arista. 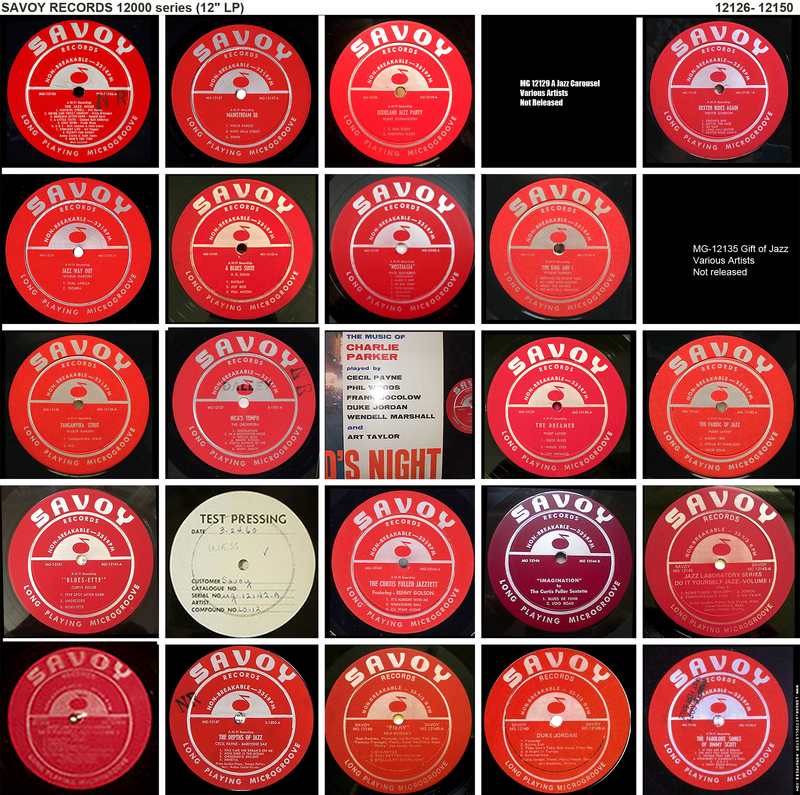 As a result, Savoy recordings are to be found in many later pressings spread over many decades: a collector minefield. 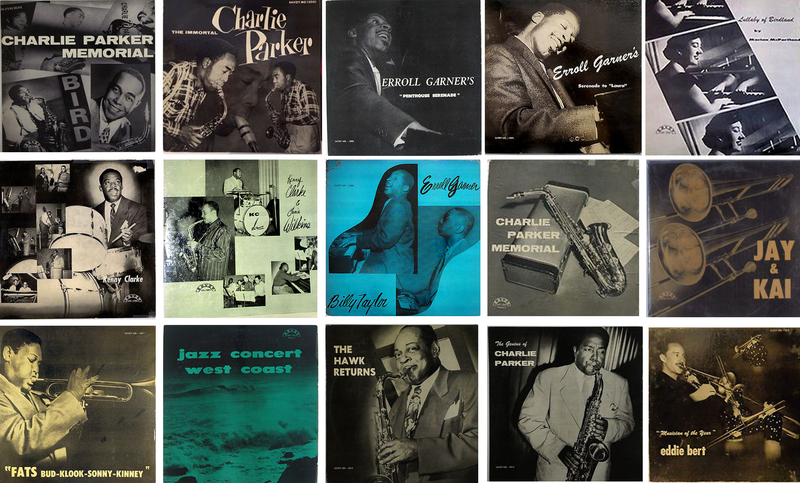 In 1955 Savoy kicked off its 12″ 12000 series with all the legends of bebop – Parker, Gillespie, Hawkins, Lester Young, Fats Navarro. In addition to the most famous jazz artists of the late ’50s, Savoy published some of the most obscure. Who can forget Herbie Brock, Vinson Hill, not to mention the great “Slam” Stewart? They made room for the new young blades, Coltrane, Art Pepper, Tubby Hayes, Yusef Lateef, Sahib Shihab and even the futuristic sound of Sun Ra. Taking the battle to the competition, Savoy bagged some recordings from the up and coming Blue Note and Prestige roster: Coltrane, Mobley, Dexter, Don Byrd and Lee Morgan. Art direction had some way to go, no Reid Miles, a rag-bag of good and not so good. 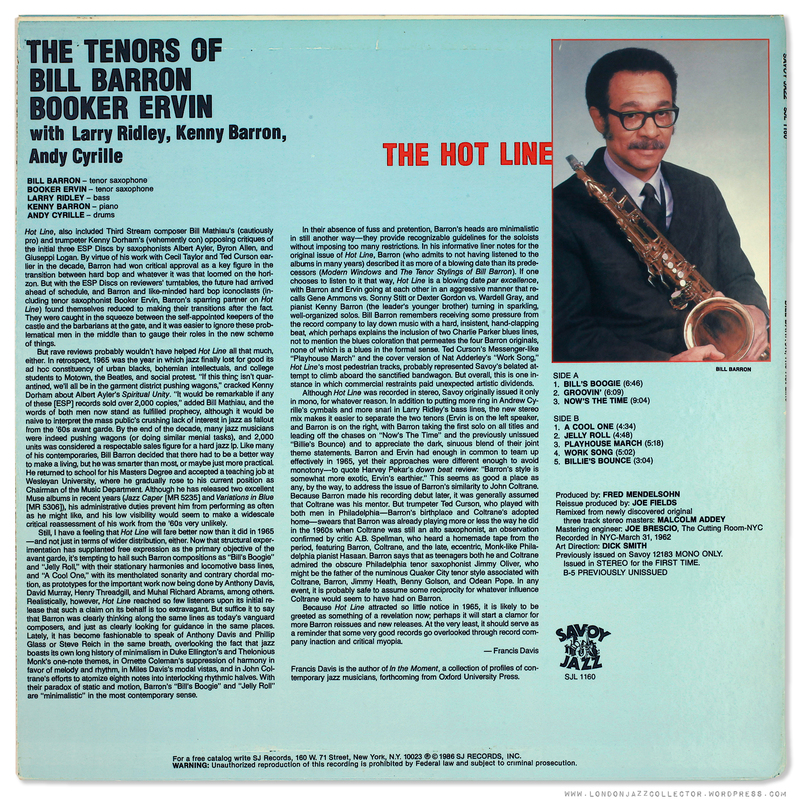 In the early ’60s Savoy still managed to produce a few strong albums of hard-driving instrumentalists like Booker Ervin, Bill Baron, Curtis Fuller, and a string of Yusef Lateef titles. And in a surprising last wind in the late ’60s, at a time when the jazz audience was fast turning to jazz rock and soul jazz, Savoy bravely chanced their arm instead on the avant garde and free jazz genre. Marzette Watts Ensemble, Robert F. Pozar Ensemble…New Advanced Jazz….courageous! 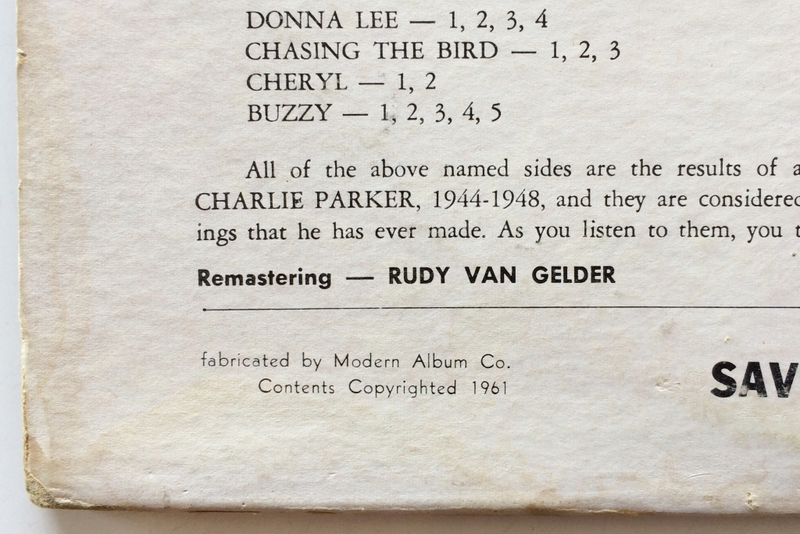 Master engineer Rudy Van Gelder recorded artists for Savoy and other labels, at his Hackensack home studio. Many Savoy LPs have Van Gelder as mastering engineer and recording engineer and RVG etched or stamped appears in the run-out. The “jazz audiophile” should be wary of recordings made prior to the early ’50s, before the arrival of the new generation of tube condenser microphones such as the AKG C12 and Neumann U47. Very early jazz recordings sound boxed-in and compressed in comparison to the spine-tingling musicians-in-the-room presence achieved by Van Gelder’s close-miking at Hackensack. They should also be wary also of Savoy reissues in the 70s and 80s, by which time the direct lineage to Van Gelder mastering /metalwork had been lost. 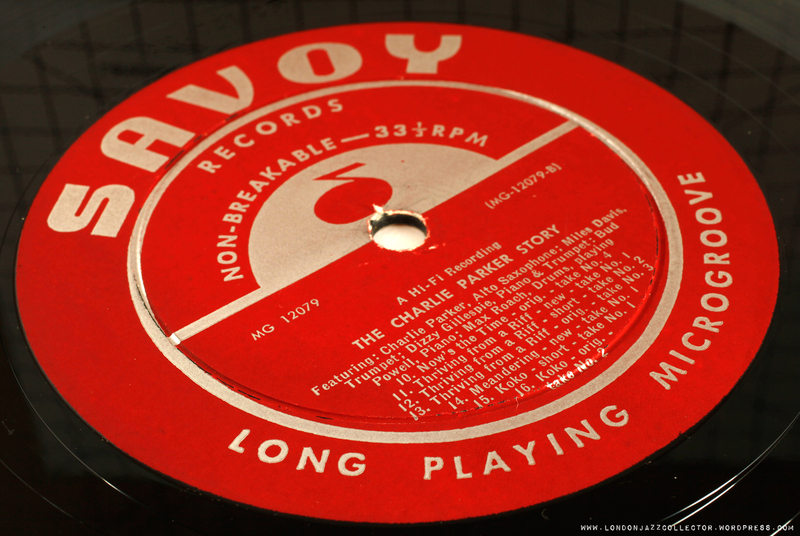 The quality of tape transfers and re-mastering by later engineers for Savoy’s new owners resulted in pressings of an impoverished audio frequency range. The loss of upper frequencies suggests undue influence of noise-reduction systems which became vogue in the mid 70’s, the exaggerated problem of tape-hiss which made Mr Dolby’s fortune, and a poor understanding of the impact of upper frequencies (over 15,000 Hz) on the listening experience, as opposed to a sine wave tone in an audiometry testing booth. The “blood red” label runs from 1956 until around 1961 and is the “original” first label on all titles up to around MG-12155. Beyond this, between 1961 and 1974, the maroon label was used for what few new titles were issued and reissues of earlier titles. The oxblood label later came into use in the mid ’70s. Colour fidelity varied between printers,, and the blood red can be a mid tone red or a darker red, but in both cases the vinyl should be deep groove. Some maroon labels are of a distinctly purplish hue. The only thing better sounding than a promo is a test pressing, of which maybe a dozen will have been made of each record in order to gain approval and sign-off by the artists. Such test pressings are usually one side only, blank the other side. 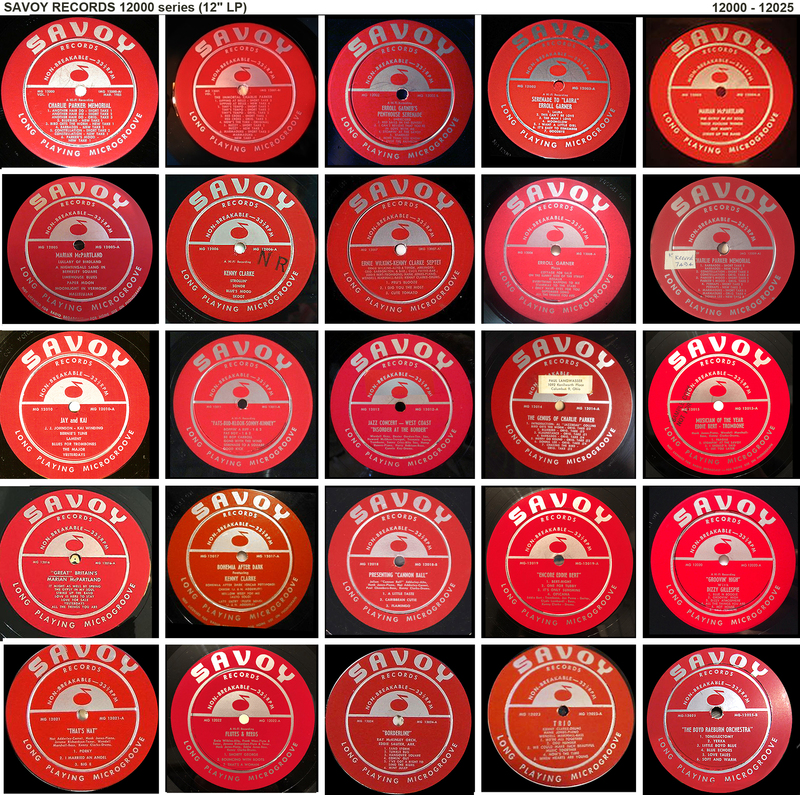 Savoy used a variety of pressing plants over the years, including “Bestway” and Abbey Mfg. The best pressings are often (though not always) promos, first off the stampers, and usually carry the provenance of first original pressing. 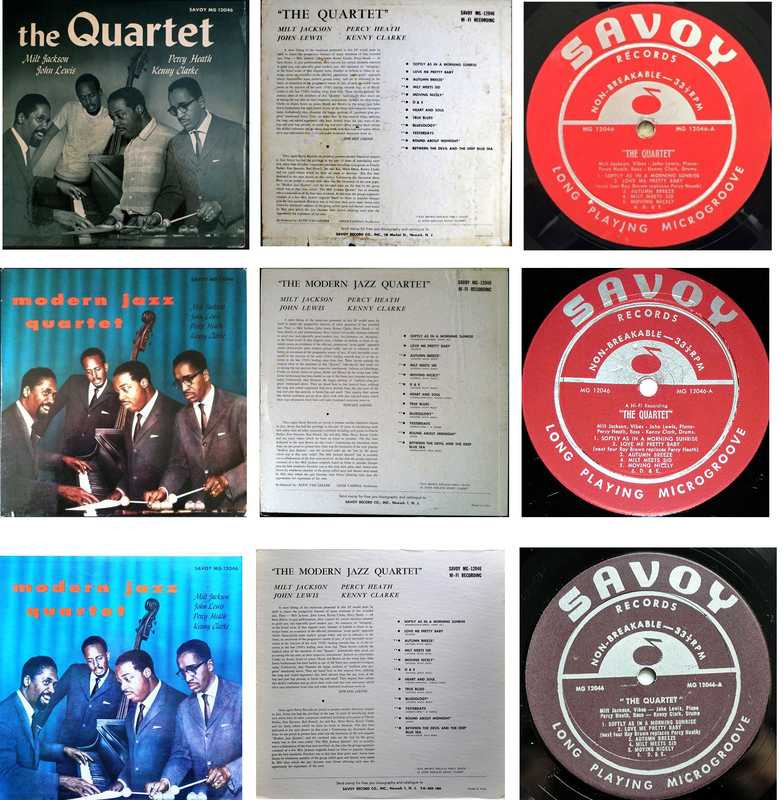 Many original pressings on Savoy have found their way to collectors in Japan, who revere the label as much as Blue Note. 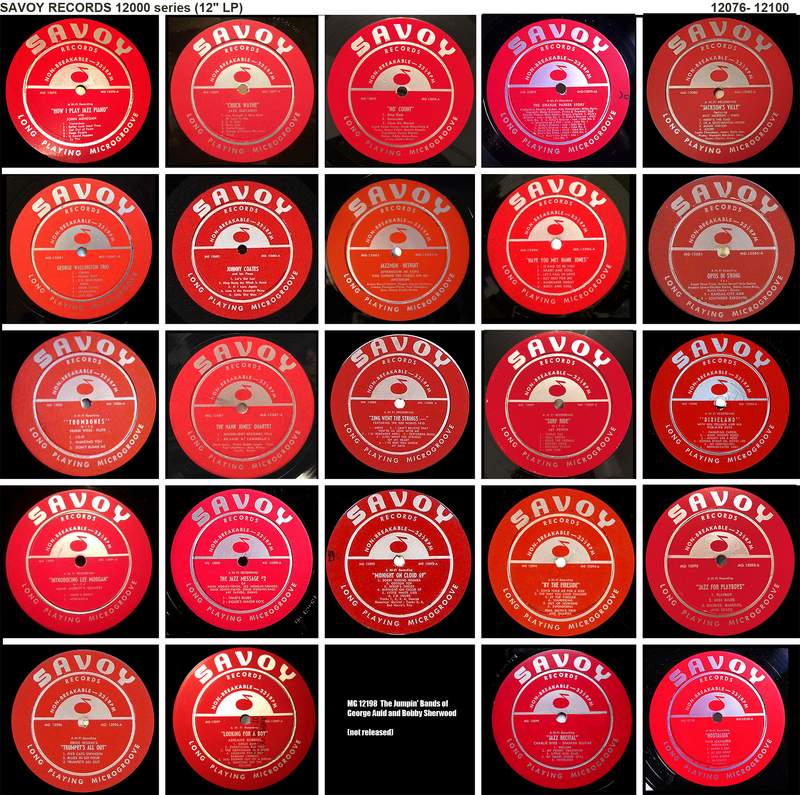 Somewhere along the line, a statement appeared at the bottom of the label rim of some Savoy labels (right below) – “NOT LICENSED FOR RADIO BROADCAST – FOR HOME USE ON PHONOGRAPH” – rubric commonly found on 10″ 78’s. Example: MG-12006 label without “Home Use” warning and with. The “Home use” warning originated from the litigious climate in which copyright laws were being tested in various US courtrooms during the ’30s. The label statement asserted that the owner of the record was entitled to use the record only for home listening, and not radio broadcast or other public performance. Before the advent of television, radio stations were an enormously important source of public entertainment, and played whatever they pleased, despite this warning. The heart of the dispute was the demand by record labels and recording artists that radio stations should pay royalties each time their recording was broadcast. The countersuit argued that when someone bought a record, they “owned it” and were free to do whatever they wished with it, including play it over the radio if they so chose. All the major record labels were entangled in copyright related lawsuits and appeals in order to overturn unfavourable previous court decisions. Band-leaders busied themselves suing radio station owners, fearing that “mechanical reproduction” would take away musician’s livelihood. 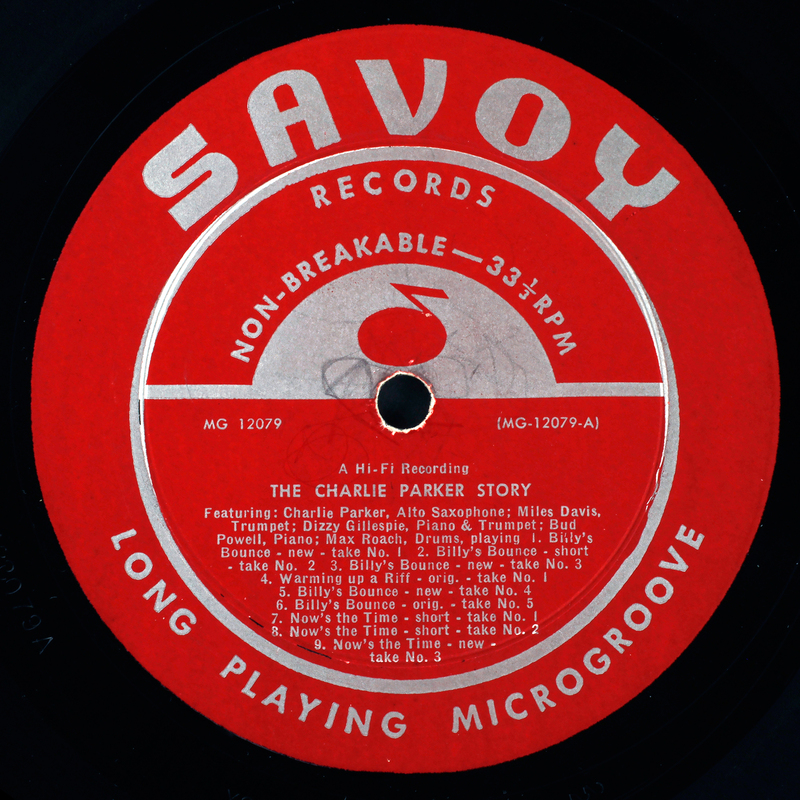 Smaller labels sent “promo” copies to radio station disc jockeys specifically for airplay to promote sales, and by the end of the ’40s the disc jockey “went from sued to wooed“. The book keepers were left with a different problem: keeping track of promotional copies, on which no sales tax was due, or royalties to be paid, as they were not “sold”. In late 1940, the legal argument that won the day that playing a recording does not itself constitute “copying” that work (as defined by copyright) , merely playing a copy of the original performance that had already been manufactured by the record company. With the growth in sales of the phonograms for home-listening, the tantilizing prospect for artists became not a few cents from radio play but the potential rewards of a new phenomenon – a hit record. None of which explains why Savoy revived “home use only” warning, a legal argument which had long since been lost. Another “unknown”, which in any event does not help in dating a pressing. The earliest labels printed include the text “A Hi Fi Recording” below the spindle hole and above the artist name. The reference to being “A Hi Fi Recording” eventually fell out of use but appears on the first issue of at least 100 titles. However there is always some uncertainty with Savoy. The NR stamp, which is found on perhaps 10% of copies, likely means “Non Returnable” – a remaindered copy of an LP deeply discounted to clear stocks – so called “cut outs”. 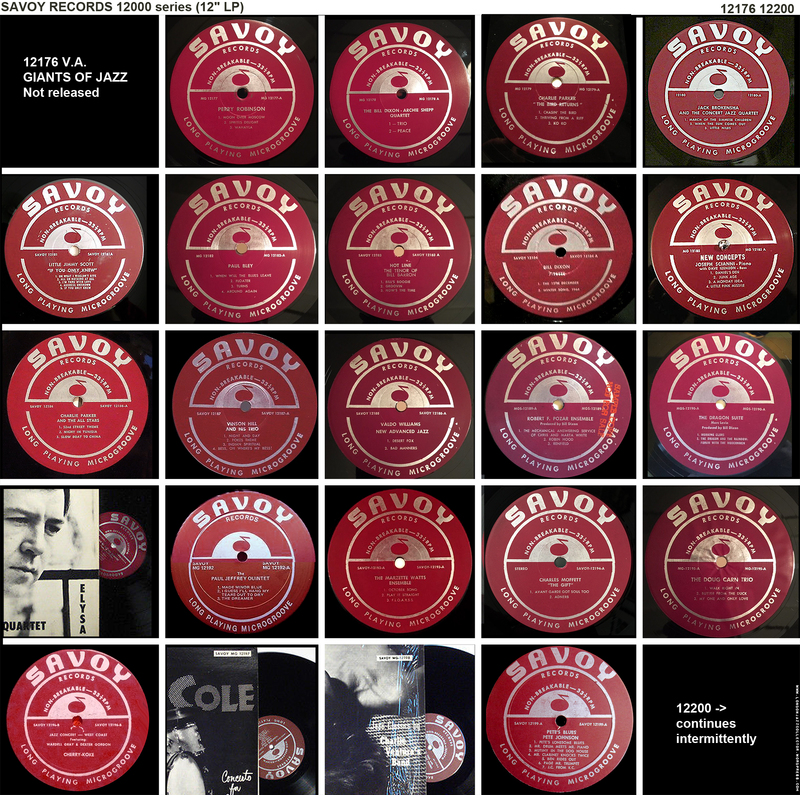 A surprisingly high proportion of Savoy records coming to auction are NR stamped label, not something seen with premium jazz labels like Blue Note or Prestige. The great Burt Goldblatt designed many of the earliest Savoy 10″ line-drawing covers, and there are some later covers by the inimitable Harvey, but apart from that, pot luck, no house style, a hotch-potch of designs either uncredited, or credited to relatively unknown names including D. Picini Jr., Richard Corson, Castronovo, Harvey Ragsdale (Surf Ride,) Stephen Haas, Levy A. Agency, Lee J. Morton, and Irwin Goldstein. 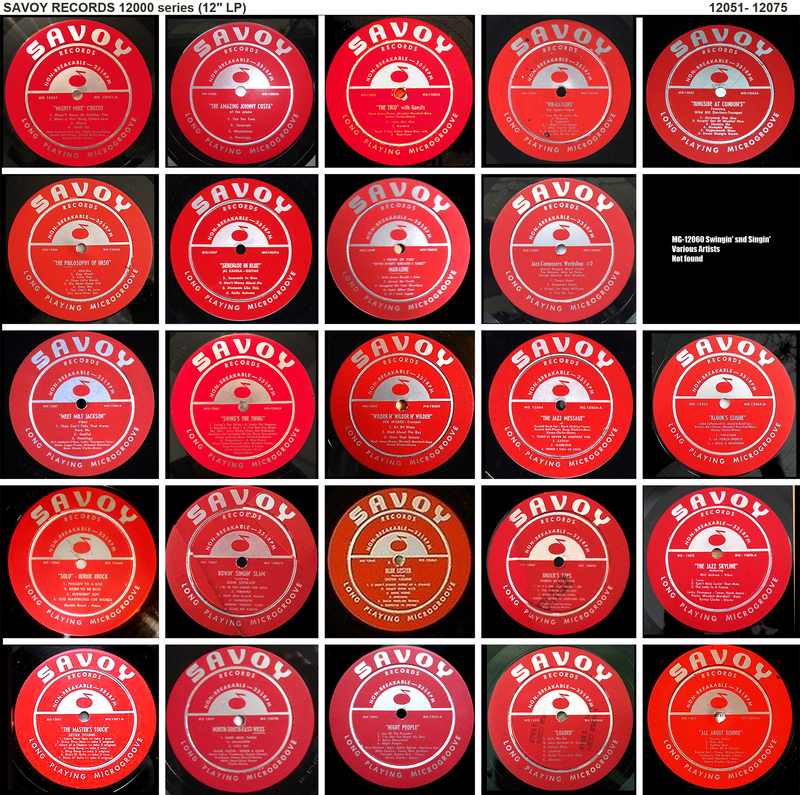 The earliest Savoy 12″ titles have monochrome artist-performing photographic covers. They are out-numbered many times over by later coloured-added and alternative covers, usually but not always associated with maroon (’60s) and oxblood (’70s) labels and later back cover zip-code (after 1962) or P.O. Box address. However, never discount the possibility of a newer record packed in an older cover. When viewed from the front, first Savoy covers appear “borderless”. The cover art paper was folded over the three closed edges of the jacket, overlapping the back, and the rear liner notes were pasted down on top of the overlap, Later, somewhere around 1962-3 / MG 12175/ (maroon label new issues and earlier title reissues), the reverse construction method was introduced. 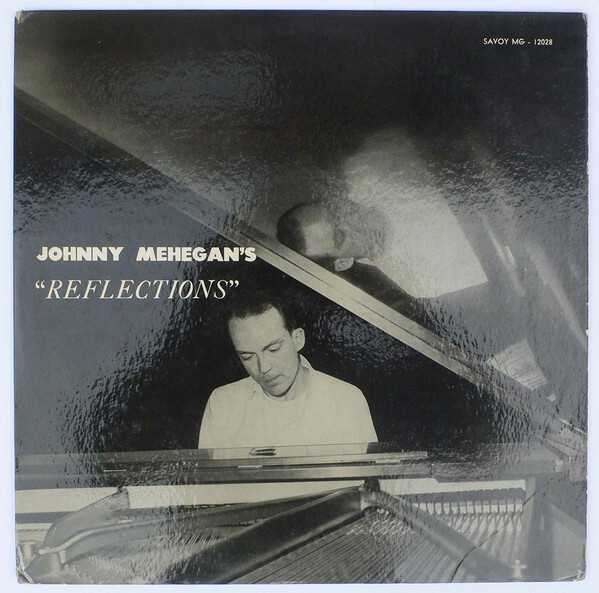 The liner notes were overlapped around the front closed edges of the jacket , and the cover art was pasted down on to the overlap on the front , leaving a white border showing on the top, bottom and left edges of the front cover. Cover art touches all the bases, from the bland, crass, stylish and dramatic . Whilst rivals Blue Note and Prestige took their cover art seriously, Lubinsky was not above catching the eye of the bachelor demographic with a large serving of cheesecake. For the sound-engineer demographic, even slipped in a bonus Telefunken tube-mic . Wholesome girls you could take home to meet mother, except perhaps the fireside flirt in the nightie (Mother! Is that you?!) Surrealist artist HARVEY also has these covers in the Savoy catalogue, also beautiful. 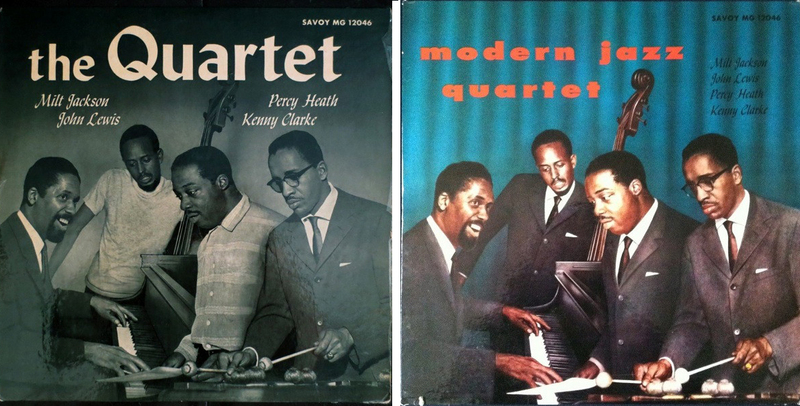 Some covers went through a stretch of more creative repositioning, like MG 12017 Kenny Clarke’s Bohemia After Dark. 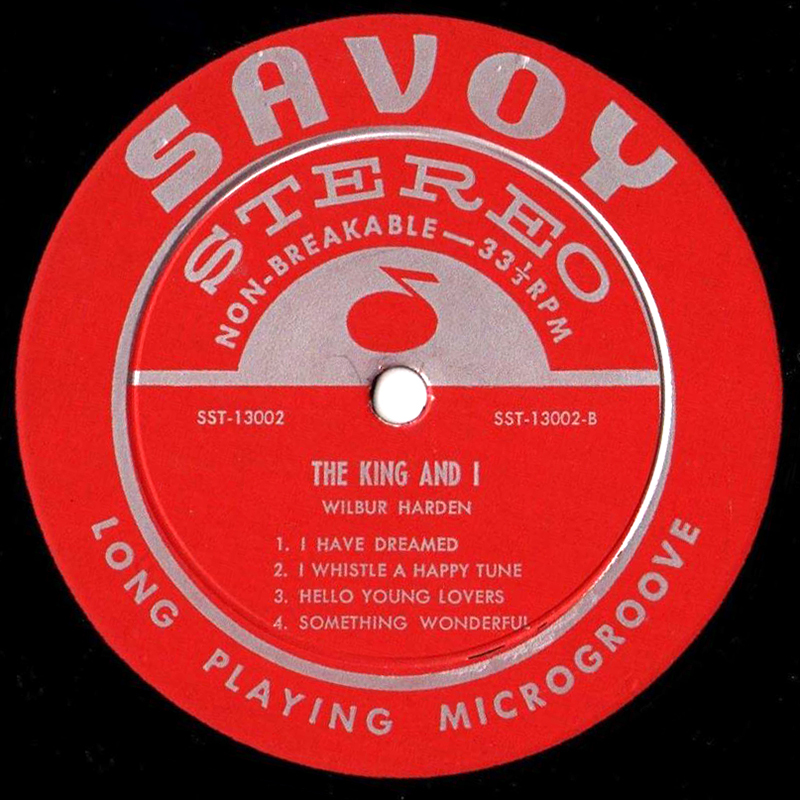 Most early Savoy recordings were mono, but moved with the times to stereo as the rest of the industry. 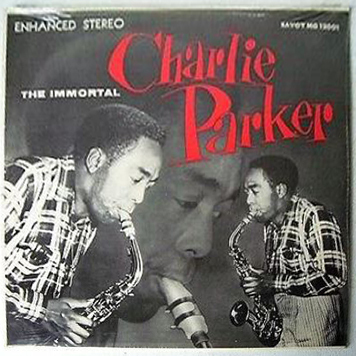 Examples are found of “ENHANCED STEREO” (fake stereo) like the reissue of The Immortal Charlie Parker. Though Van Gelder recorded everything to two-track tape from 1958 on Savoy perhaps jumped the shark, put out a few stereo titles before the market was really ready for the new format, yielded disappointing sales, and lost heart. By the time stereo had become mainstream, in the early to mid ’60s, Savoy had changed musical direction. 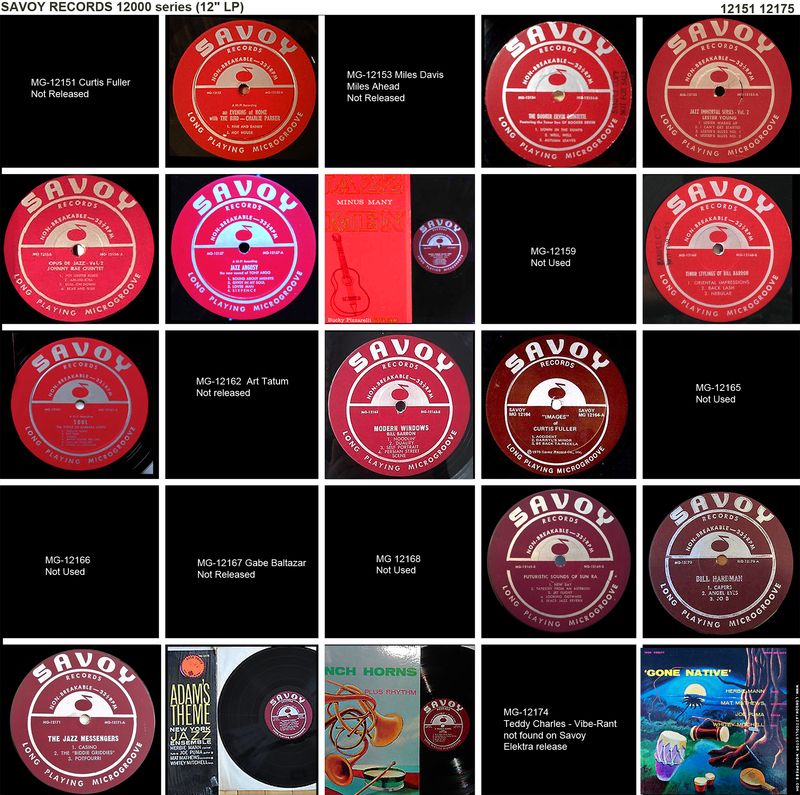 The whole Savoy stereo jazz catalogue amounted to just a dozen albums, five of which are missing below as no original stereo copy has ever appeared at auction. The stereo label was introduced with a first release in March 1959, but it was not to last long. 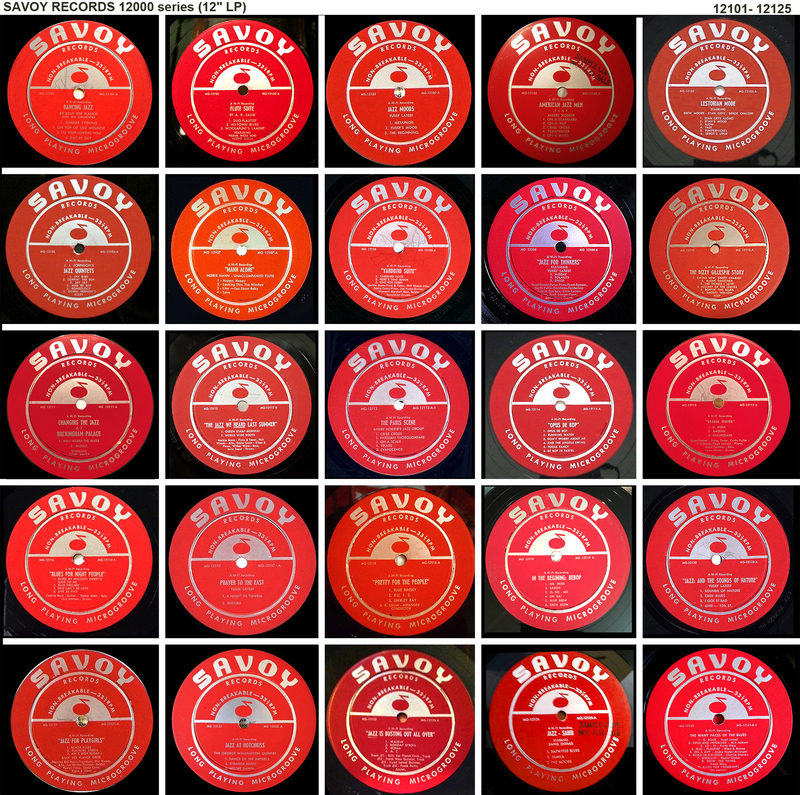 Just a handful of copies of labels like 1 and 3 below are found, blood red and deep groove. 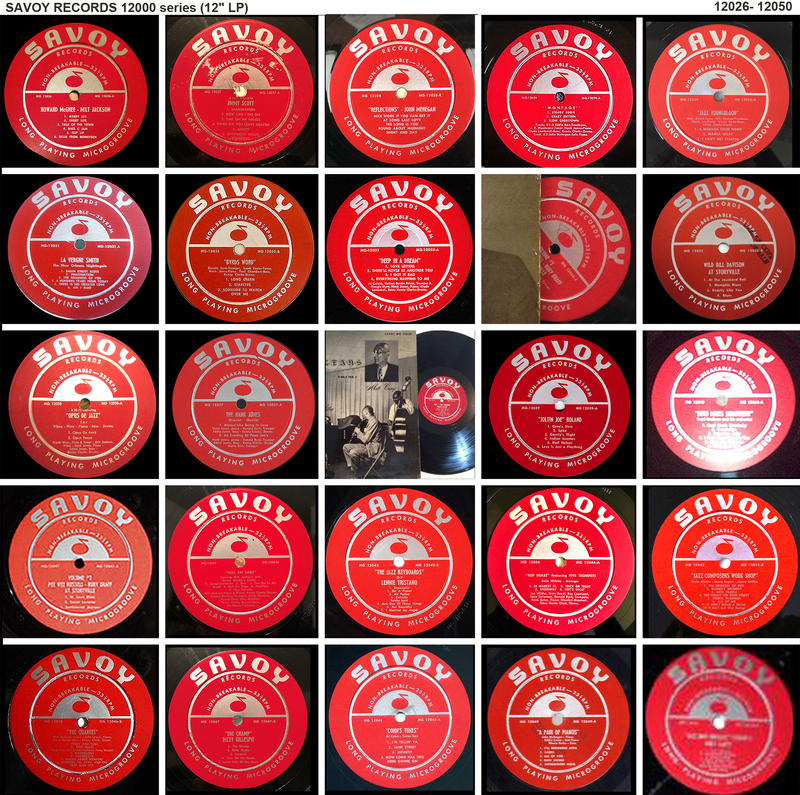 Most stereo Savoy copies are much later reissues, with maroon or more often oxblood labels without deep groove. Label 2 below is maroon DG, post-dates label 1 for the same title, yet carries a promo stamp. Savoy was still plugging away to make a success of stereo through promotion, looks mid-’60s. As stereo became commonplace and the defacto release format, the stereo label itself became defunct, and later stereo reissues revert to the simple classic label without the word stereo on the label. Stereo original editions are extraordinarily rare, some titles may never have reached production, and are found only as reissues on the French BYG label and Sony Japan. To establish early provenance (’50s), check cover art (monochrome? ), check cover manufacture (no white border), check label colour (red not maroon or oxblood), check back cover address (58 Market Street, no zip-code or P.O.Box), check everything. Savoy was chaotic, but keep a cool head and you can master it. 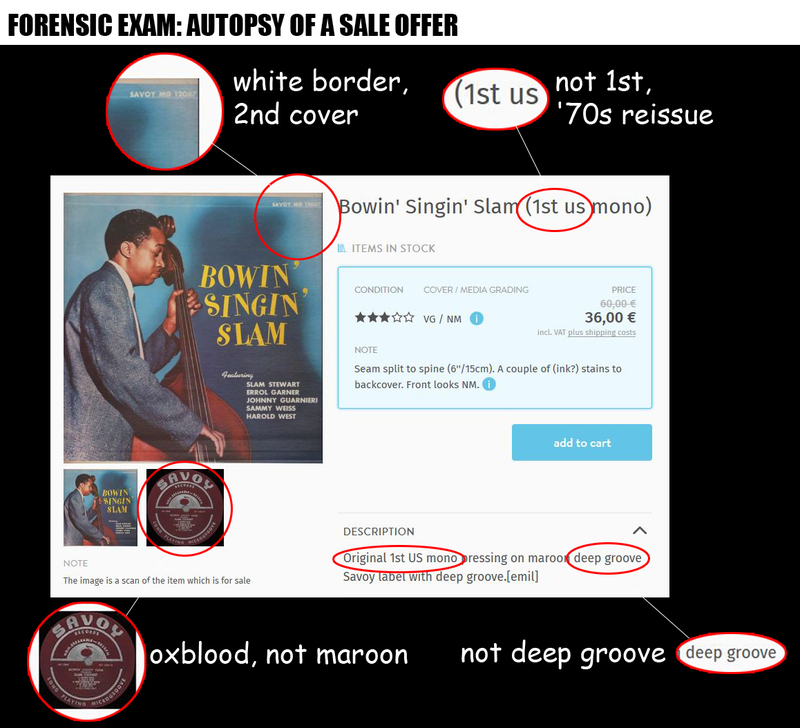 Apply your new skills to the seller below offering an “Original 1st US pressing, maroon deep groove label” Apparently. Like most things in life, It’s easy – when you know how. 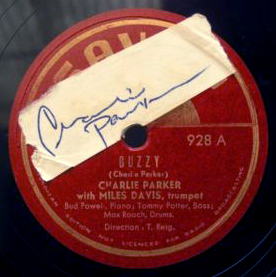 Only a small handful of Savoy titles have ever crossed the $1,000 line, which includes this exceptional item: Savoy US 928 (10″) Buzzy & Donna Lee by Charlie Parker, signed during the series of concerts in France in May 1949. Of the rest, Curtis Fuller “Blues-ette” (MG 12141) reaches the dizzy heights of $800, keeping company with some Parker 10″ titles and the outrageously desirable Lee Morgan/Hank Mobley title “Introducing Lee Morgan” (MG-12091). Pretty quickly auction prices fall below the $500 line with Art Pepper’s Surf Ride (MG12089), and Hank Mobley’s Two Message titles (MG-12064 & 12092). Sun Ra Futuristic Sounds(MG 12169) rounds out the short list of most collectable titles. Thereafter, it is all the fun of the fair, some titles are very rare without being of musical interest, others offer some great music at a bargain price. I have my eye out for that Sahib Shihab Jazz Party MG-12169. So in summary, a mostly inexpensive treasure chest of American jazz recordings jazz but a nightmare for the jazz collector, poorly documented, leaving the rest of us mostly groping around in the dark. They say, fools rush in so LJC takes his cue and limbers up. Now we go deep dive into the murky world of “original vinyl” and what collectors need to know. But first, a look at the possibilities in overseas issuesand later reissues. 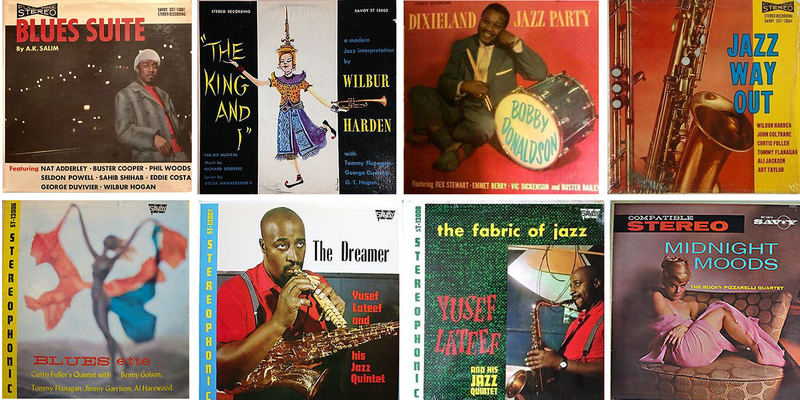 Reissues of Savoy Recordings: 1950s – 1960’s – 1970s – 1980s. 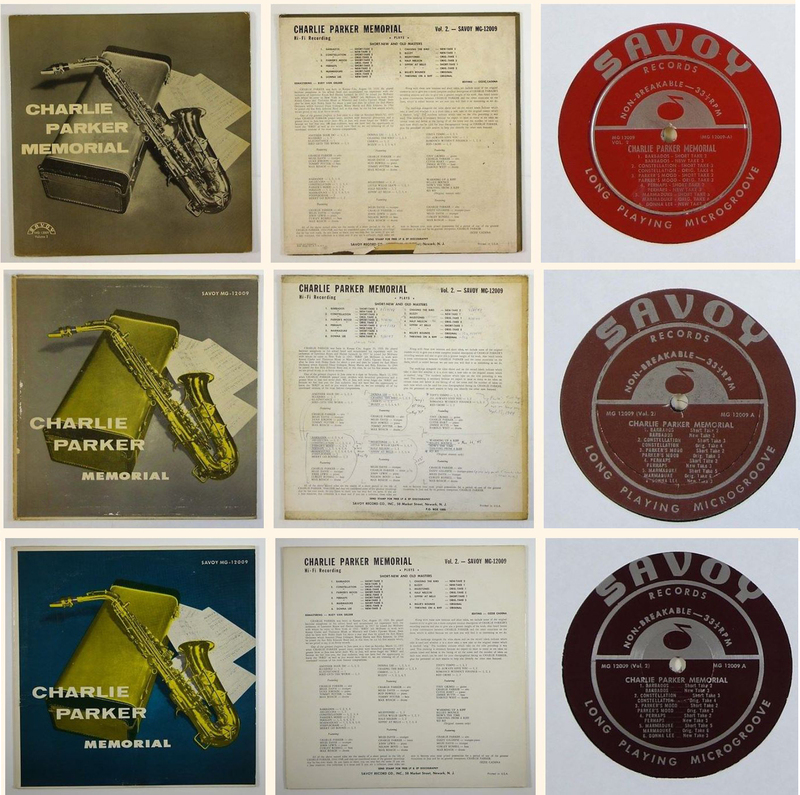 Between 1963 and 1970 around fifty of the two hundred Savoy Records jazz series were reissued in the UK on the CBS Realm label, with alternative covers, re-mastered from copy tape, mostly pressed at the CBS acquired Oriole plants in Slough and Buckinghamshire. In France, the equivalent programme was issued on Savoy Musidisc SA 6000 series. The Japanese reissue history is complex, a King Records Series in the 1980s, and Sony Japan, out of scope, for future research. By the mid-’70s Savoy Records had run its course, with Lubinsky’s death in March 1974. 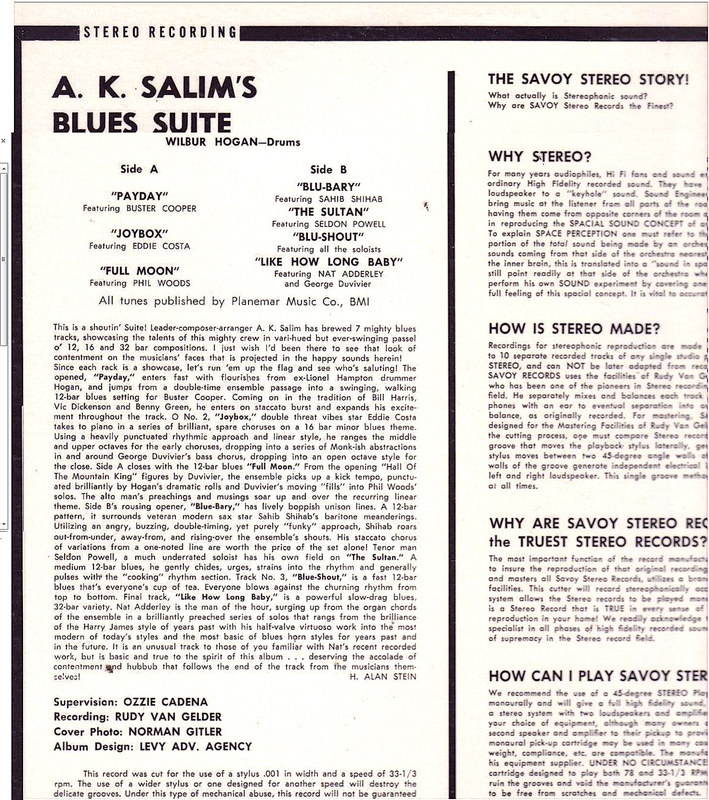 Former CBS executive Clive Davis had created Arista Records with funding from Columbia, and the following year bought the Savoy Catalogue from Lubinsky’s estate. Arista reissued many Savoy recordings on a new Savoy Jazz Classics label, much like the Prestige OJC Original Jazz Classics brand. 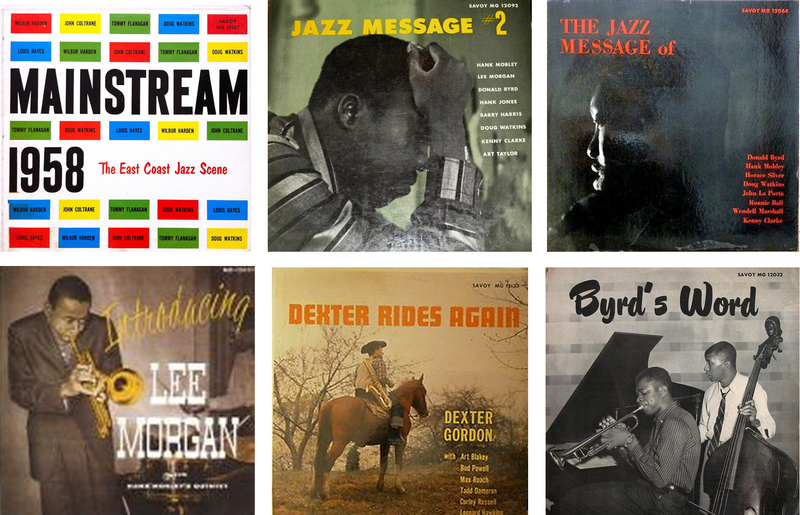 Music producer Bob Porter was brought in to produce many of these reissues. The occasional Savoy Jazz Classics reissue series turns up re-mastered by the master, VAN GELDER. The original metal perhaps lost, Rudy was brought in to re-master from his own tapes (or copies of his original tapes). 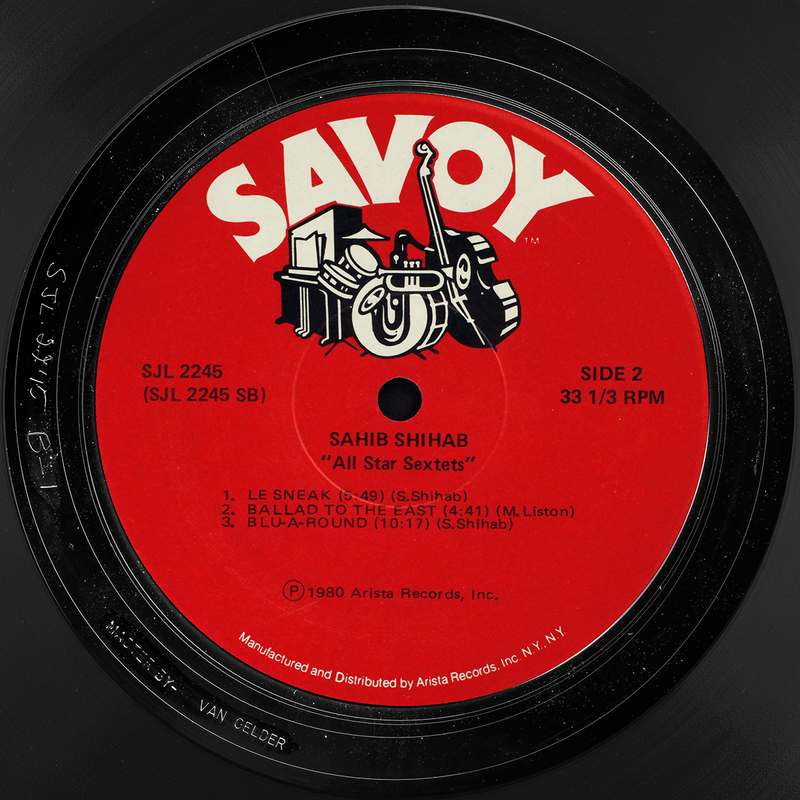 This Sahib Shihab reissue bears the text “SJ Records, 160 West 71 Street, New York NY 10023 ©1984” and “Mastered by Van Gelder” in the run-out. Arista reissues have proved a mixed bag. Savoy re-issues should sound much better than they do, given access to original tapes, even the occasional one with a VAN GELDER stamp. 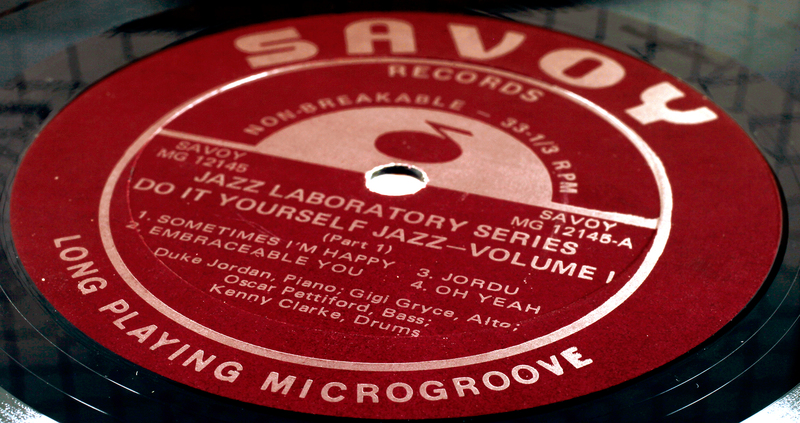 In the mid-’80s, Muse Records proprietor Joe Fields bought the Savoy catalogue, maintaining the Savoy Jazz “bunch of instruments” logo, and reverting to the earlier classic Savoy label design. 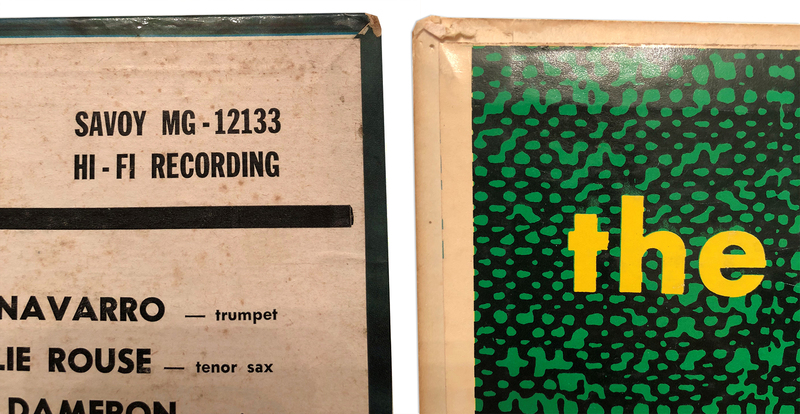 Fields brought considerable scholarship to the catalogue, with fresh academic liner notes and carefully curated selections, and worthy but dull covers like the reissue of MG-12183 Bill Barron The Hot Line, left original, right SJL 1160. 1986 – more or less end of the line for vinyl. These mid-80s SJL reissues are among the worst sounding audio in my entire collection. Lifeless, tonally compressed, top-end rolled off, an ignoble end to a great label. Waiting to be discovered is the untold story: what happened to Savoy’s Van Gelder masters after Lubinsky’s death? Arista and Muse may have bought the Catalogue of recordings, the legal rights, but what they produced in the way of vinyl shows no sign of original metal used for reissues. Everything was re-mastered. Even when, for the odd title, Van Gelder was brought back, he had to re-master himself. Perhaps someone didn’t know the importance of what they had, and they were discarded, as the priority was legal ownership of the rights, and re-mastering from copy tape normal industry practice. 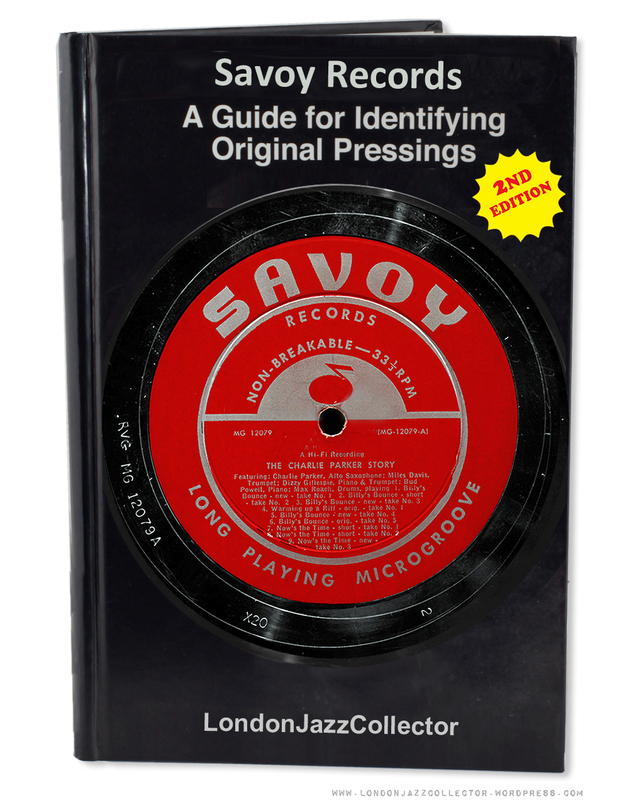 Savoy Records, Record Collectors Field Guide. The auction description “original” is probably miss-applied more often with Savoy than better-defined ones. 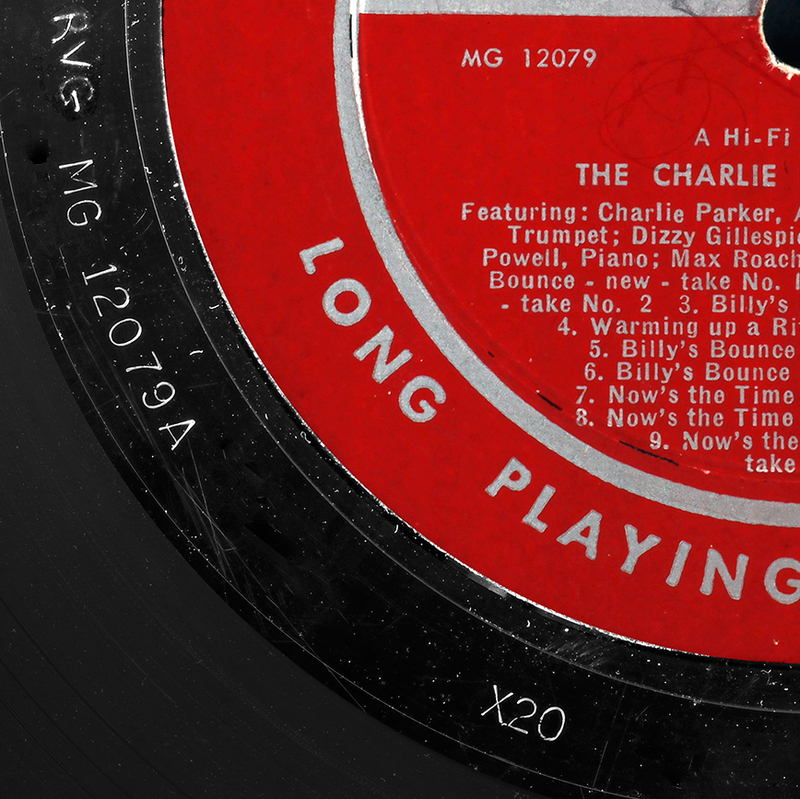 As with all other jazz labels of the golden era, the identification of provenance requires insight into label colour, run-out pressing die types, liner notes corporate address, cover lamination, matrix stamp, printed spines, any amount of detail. Provenance is sometimes obscured by the record company perhaps not wishing to identify reissues as such, and sellers taking advantage of the lack of information on date of manufacture, compounded by some very poor quality product photography that leaves buyers guessing. The red original ’50s is deep groove, the maroon is mainly ’60s, some deep groove early on but transitioned to the central disc impression. The oxblood which dates from the mid ’70s onward, is not deep groove. For example MG-12127 “Mainstream 58” – Harden/Coltrane – is found on all three labels: the original 1958 and two subsequent reissues. According to the year of first release, the prized “original” may not be on blood red label, or deep groove. The presence or absence of deep groove is probably the main arbiter between original and subsequent pressings. The impression left by the dies which held the stamper in the record press are the strongest clue to identifying the earliest Savoy pressings and distinguishing them from later reissues. The outer deep groove ring is the signature of 12″ LPs manufactured in the later half of the ’50s and early ’60s (though as always some exceptions). 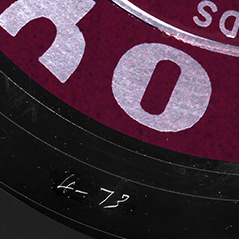 The die was modelled on that of 10″ shellac discs, widely used in most pressing plants, and were gradually phased out in the first half of the ’60s, replaced by dies which left much less significant trace. 3. Single-step outer pressing ring roughly aligned with the outer silver ring, possibly ’70s onwards? It is not the wide flat-bottom trench of Type 1, but neither is it the familiar single step-down of later die impressions. Catching the light and shadow reveals a different type of deep groove, which I name Type 2. Viewed in flat lighting (below), it is less obviously deep groove, cutting in and out of different sections of the silver outer circle. The etchings contain a give-away date – 4/73 and no RVG in the deadwax, so the maroon label may have stretched from the mid ’60s to the early ’70s, before the oxblood red label was introduced. According to Discogs this title is a 1955 recording on the Signal label (S-101) reissued by Savoy in 1959. May be, but this maroon label looks a lot later than 1959 and the dead-wax etching “4-73” suggests otherwise. Discogs is a useful collector/seller guide but not necessarily always accurate. Most Discogs entries for Savoy on maroon and oxblood labels are dated “Unknown”. Unlike Blue Note and Prestige, for whom company address changes were clearly delineated, there seems little consistency in the display of Savoy’s company address, to which record collectors could write for the catalogue. Most helpful to have evidence from promos to link the cover to early release. 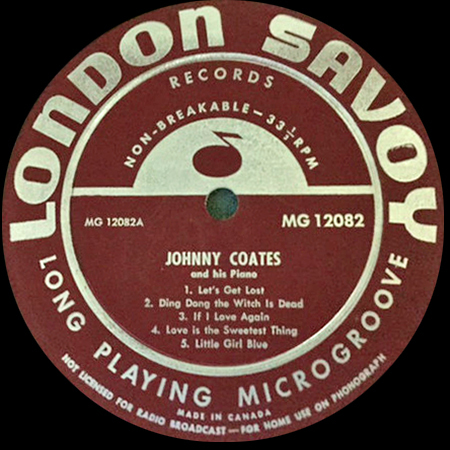 At the outset Savoy had a definitive early address, 58 Market Street, accompanying titles released in the halcyon years 1956-7, a hundred or so titles accompanied by blood-red labels with deep groove. Note very early on, the absence of incorporation in the company name – “Savoy Record Company” – no Inc., but added soon after. 58 Market Street, Newark, N.J.
SAVOY RECORD CO. INC., NEWARK, N.J.
also seen as earlier NEWARK 1, N.J. The 58 Market Street address seems definitively associated with early issues of titles. The address changed over time, notably following the introduction of postal codes by USPS. A 5-digit postcode dates the cover as after 1963. New titles in the 12000 series continued to be released by Savoy up until at least 1969. The generic company address may be original or reissue, and the label itself is more helpful. Update: Did half the MJQ forget to pick up their suits from the dry cleaners? Monochrome 1st cover: two suits, blood red label and Type 1 deep groove, 58 Market Street address. 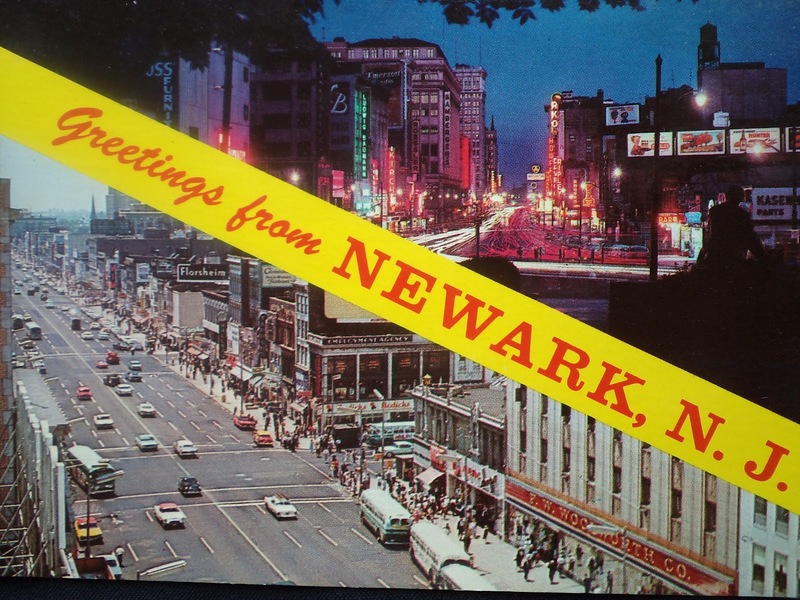 Coloured 2nd cover: four suits, darker red label still deep groove type 2, Newark 1, N.J. address. Later address changes were driven by the evolution of US postal service zip-codes and a lax approach to naming conventions and consistency. Some times it’s New Jersey, others it’s N.J., sometimes it’s in upper case, other times in proper case. The presence of a zip code indicates a cover manufactured after 1963. According to Japanese collectors with many Savoy titles, both the X20 and RVG transition at some stage from hand-etch to machine stamp. What X20 means is anyone’s guess, it is also found on the matrix of Savoy 10″ 78s, but it is a point of detail which matters little since they all have it. Not all labels could be found, and some element of guesswork from those found as to which is the earliest, which is the main aim, however there is now continuity in the blood-red deep groove, and a transition to the maroon label. The Savoy Jazz series continues intermittently beyond here (1962-1973, catalogue numbers MG-12200 – 12230 or thereabouts ) but now a chaotic label, few new recordings, planned releases not issued, compilations unable to get all the rights sorted out, some titles with negligible sales. The maroon label and its successor the oxblood is all that can be found, and grooveless reissues on blood red labels muddy the waters. Any additions or corrections to the work here are welcome, post to email under Contact LJC in the banner heading.